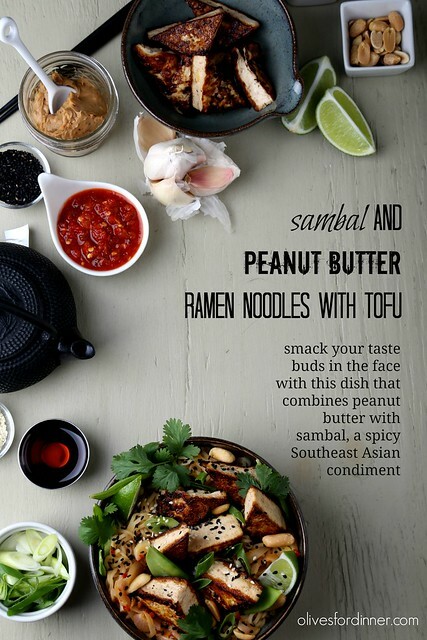 I love the combination of sambal and peanut butter in both savory and sweet applications. I have even slathered these two things over bread, sprinkled with brown sugar, slapped them together and grilled it to gooey perfection with a bit of Earth Balance to help it toast up perfectly. It’s fantastic. Sambal is a chunkier version of sriracha that (to me) tastes more salty and less spicy. I’ve used it in a sauce slathered over seitan skewers and in croquettes and it not only introduces a perfect amount of heat, but also deftly balances out other flavors in a dish. So when I found some ramen noodles in my pantry the other day, this combo came to mind and I began to make a sauce I could toss the noodles into. Once the sambal and peanut butter hit the pan together, they release an aroma that is cozy, clean and irresistible—which is what makes spicy food feel and taste so good in the first place. 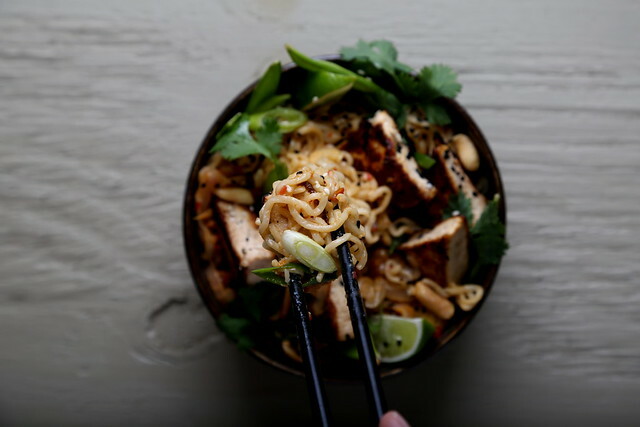 Once the sauce was done, it clinged perfectly onto the noodles, which I finished off with some tofu and mixed vegetables for an easy, fragrant and pleasantly spicy dish. any variety of vegetables like snow peas, mushroom, baby corn, bean sprouts, etc. Prepare the tofu, using this quick and easy method. While the tofu is browning, whisk the sesame oil and soy sauce in a medium-sized bowl. Once the tofu is browned on both sides, transfer it to the bowl and toss well to coat. Set aside. To make the sauce, heat 1-2 tsp oil over medium heat. Throw in the sliced shallots, stir to coat, then saute for about 4 minutes, lowering the heat if they start to brown. Add in the garlic, stir and saute for 2-3 minutes more. Once the shallots and garlic are soft but not browned, add in the sambal and stir, then add in the peanut butter and gently stir until melted. Add in the brown sugar and vinegar. Increase the heat to medium-high, then add in the broth. Allow the mixture to come to a full simmer, then remove it from the heat and allow it to cool. Boil the ramen noodles according to the package instructions and drain. Toss with the sambal and peanut butter sauce. 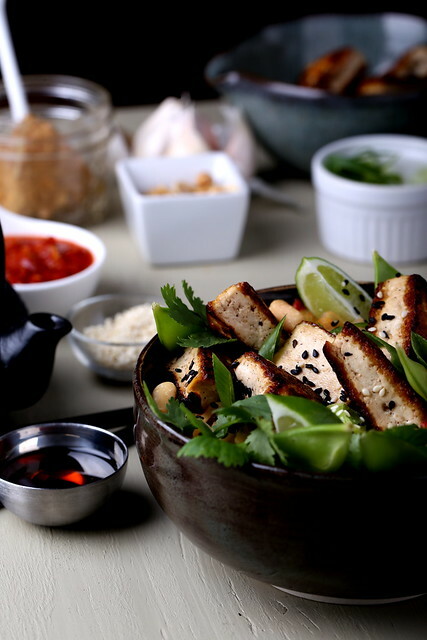 Distribute into two bowls, and top with the tofu, drizzling any extra sesame oil over the top. 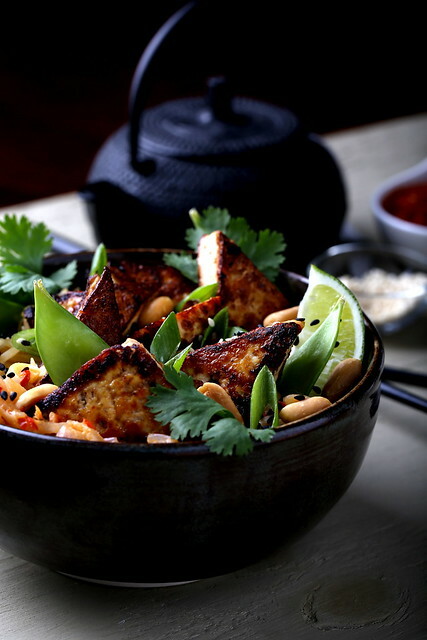 Garnish it with vegetables, sesame seeds, scallions, cilantro, lime wedges and chopped peanuts as desired. Serve immediately. Sounds wonderful! Just to clarify the tofu is marinated but not cooked after that? I altered the text above slightly to be more clear. Follow the link that tells you how to brown the tofu (http://www.olivesfordinner.com/2014/01/15-minute-quick-and-easy-tofu.html), then toss it into the sesame/soy mixture once it's browned. There's no marinating here — just coating the cooked tofu. I hope you enjoy! This looks delicious! Do you think I could use almond butter in place of the peanut? Elle, I haven't tried that, so I can't say for sure, but it's worth a shot! You could also sub coconut cream for the peanut butter here. It will give it a different, but equally creamy and complimentary flavor. I hope you enjoy! Thanks Erin, that's a great idea! I have a tub of creamed coconut in the pantry, so I'll give that a try. Wow, this looks amazing! It's been far too long since I've had marinated tofu (dare I say well over a year?! What's wrong with me?). Sounds wonderful! Wish I had read this before I cooked tonight… we had stir fry and tofu, but not as exciting as this. I LOOOOOVE Sambal! I mix it with yogurt for dipping french fries! LOL! Oh, and it's good in Asian food too. 🙂 This sounds so good. Definitely pinned. We have garlic and onion intolerance here, do you think a couple of spoonfuls of ginger and lemongrass in the sauce would help brighten stuff up? Thank you! Ginger and lemongrass will add a very different flavor here, but it might work! Alternatively, you could just leave the shallot/garlic out and I think it would still be good. I hope you enjoy, Yanic! This looks wonderful, love the sesame and PB flavor combo. Thanks! Made this for #meatfreemonday, it was delicious. I'll definitely be making it again. I'm so happy you liked! Thanks for making it and your kind feedback!